A.V. Max Cuff via Lemon Stripes // Michael Kors Watch // Julie Vos Bracelets c/o // Essie "Blanc"
This is one of my favorite looks ever! 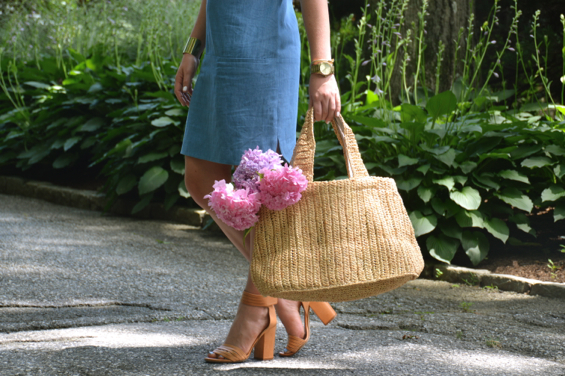 A chambray dress is such a wearable item that transitions from season to season. 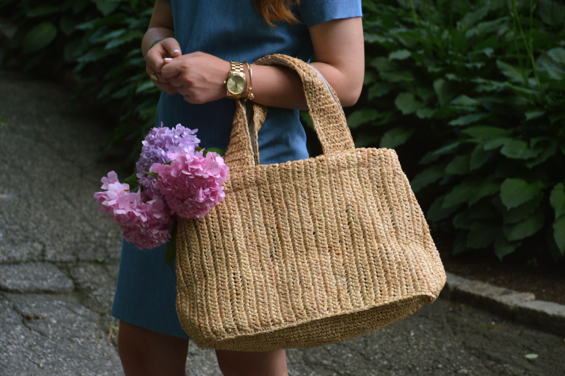 I paired the dress with my go-to items; Vince heels, a straw tote, and gold jewelery. The cut of the dress is perfect- it has some stretch and fits nicely all around. Can I mention how beautiful these flowers are from the garden,?! The colors are incredibly vibrant and perfect for tabletops around the house. This is literally the cutest outfit ever. I need that dress and those sunnies! love the dress! it looks great on you!